SALE: Enter "orchid" and save! Getting a good deal is the ultimate way to lift your spirits. The Flower Pot always has new discounts for our customers. Our new coupon system allows you to know exactly how much you are saving on our products. The stunning phalaenopsis orchid plant like the one pictured here is featured on our home page as the deal of the moment. 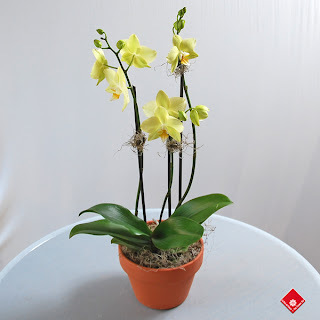 Order one and get 25% off by entering the word "orchid" in the space reserved to that effect during the payment process. According to Wikipedia, growing Phalaenopsis orchids at home has become very easy because of the creation of certain hybrids. Place your orchid in moderate light conditions and not in direct sunlight. Keep the plant in temperatures between 15 C and 25 C (59F -77F). If you have any questions at all, be sure to call us 514-938-1234, visit us online, or stop by the store to check out our other products! We will be only too glad to assist you.